Where you live affects how you live. Is your home a healthy environment? At Atlas Labs, we know that you take the safety of your home seriously. To that end, we are committed to helping you get the data and information you need to protect your property from hazardous materials and poor air quality. We conduct indoor air quality testing in Portland, Oregon, as well as the Vancouver, WA, area. You can count on us to help you identify unseen threats, so you can take the appropriate measures to make things right. What's in the Air in your Home? 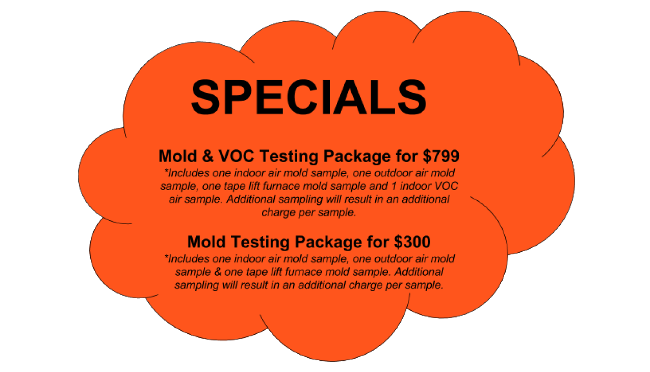 * Mold testing in Portland, Oregon includes; one indoor air quality sample in your home, one sample outdoors and one furnace tape lift to let you know the air quality in your home. Our company is committed to providing honest and upfront assessments of your property. As such, we have provided some helpful facts and information about air quality, VOCs, and mold and mildew. If you believe that your home may be compromised by these contaminants, do not hesitate to request an indoor air quality inspection. We’ll set the record straight so you may make the necessary adjustments to your property. Find out what particles are drifting around the air in your home. This test includes a comprehensive test that will give you actual particle counts of dust borne pollutants such as mold, pollen, mites, dander and others. In addition, in 2004 the IOM found sufficient evidence to link exposure to damp indoor environments in general to upper respiratory tract symptoms, cough, and wheeze in otherwise healthy people and with asthma symptoms in people with asthma. The IOM also found limited or suggestive evidence linking exposure to damp indoor environments in general to shortness of breath, to respiratory illness in otherwise healthy children and to potential development of asthma in susceptible individuals. In 2009, the World Health Organization issued additional guidance, the WHO Guidelines for Indoor Air Quality: Dampness and Mould. Other recent studies have suggested a potential link of early mold exposure to development of asthma in some children, particularly among children who may be genetically susceptible to asthma development. The simple fact of the matter is that mold in your home can spell discomfort and danger for each member of your family. As a microorganism, mold can infiltrate your property and propagate to dangerous levels. In order to deter mold growth, it’s important to maintain a clean, dry, and sanitary home. Knowing the warning signs beforehand can also save you time, money, and undue stress. A mold air test by an experienced team can give you the information you need to make sound and rational decisions. Our company has the resources, materials, and equipment to screen your property for the presence of mold. By utilizing sophisticated technology and thorough testing procedures, we can provide upfront, in-depth analysis of your home and the presence of mold. Our reports can also inform you of potential threats and what you can do to address them. Don’t compromise the health and safety of your family. Arrange a building safety inspection [link to Home] with our team and get the right information. The results of our indoor air quality tests can help you make the proper decisions to guard your home against volatile compounds, microorganisms, mold, mildew, and more. Contact us at (503) 430-5290 or (360) 852-8936, to be connected to our Vancouver location,to arrange testing for indoor air quality, VOCs, and mold. Our company proudly serves property owners throughout the Portland metro area and Southwest Washington.